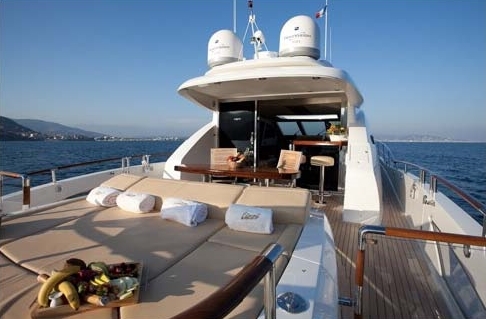 The extra large cockpit aboard this one-deck, 76’ Lazarra motor yacht LIZZI fits in a bar, sunbathing beds, and alfresco dining for the comfort of guests. 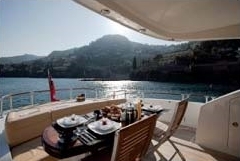 As well, there is a feeling of space in the split level, industrially appointed, modern saloon, which looks down onto the galley and foyer, off of which are four excellently appointed guest cabins. 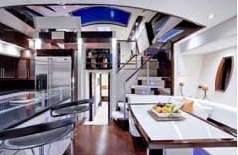 Where other yachts Lizzi’s size have bulkheads forward of the saloon, blocking the view forward and light, LIZZI has windows, and the large sky light over the galley lets in lots of natural light. 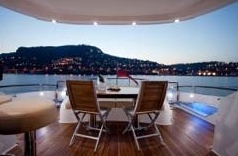 The yacht’s 2015 refit ended in October, which included new teak and holly floors in the main saloon, and this saloon shines with gleaming, high gloss wood paneling, lots of windows, glittering object d’art, and the steering station, which is right out of Star Wars with two leather steering chairs in black…. LIZZI’s captain and first mate Tristan and Harry are the perfect age for operating charter yachts…. In their late twenties, they are tall, handsome, enthusiastic, and knowledgeable. Tristan the captain from the UK has been aboard for 8 years. Harry is a rising star. His job, among other things, is to drive the 8 meter Chase boat that is LIZZI’s tender, which transports guests to shore in dry comfort. This chase tender also runs the sports equipment – wake board, water skiing, knee boarding, etc. In other words, Tristan doesn’t tow the Chase Boat on long passages. Harry drives it, following LIZZI wherever she goes…. 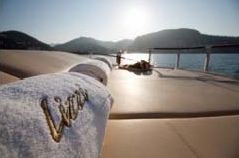 There are three crew aboard LIZZI…. Jade is the chef, who complements this great crew of three with her wonderful surf and turf menu, imaginative plating, and pleasant personality. 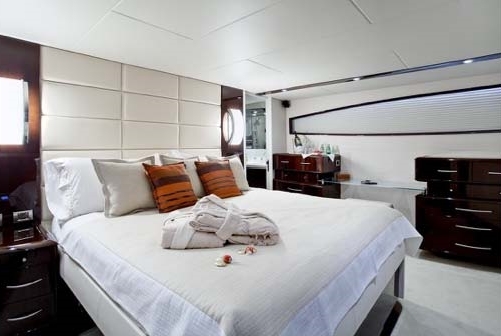 For 73 feet, LIZZI has a great deal of space, including two full beam ‘master’ cabins, each with double berth. There are also two mirror-image twin cabins, whose single beds convert to doubles. Each stateroom has a private bathroom. LIZZI’s phenomenal full beam master is located in the widest part of the ship and has windows in the hull on both sides of the cabin, offering great views just above the waterline. The yacht no longer carries a jet ski…. Their “beach club” lowers into the water….or it remains above for use with the tender…. 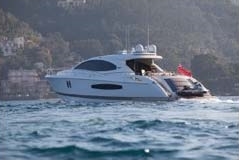 There are fitted sunbathing cushions on the bow forward with cup holders. 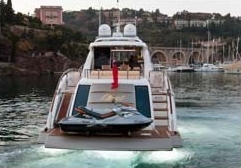 Economical on fuel, LIZZI bases in the South of France and charters for 28,000 Euros during June and September and 33,000 Euros during July and August plus 35% APA (advance provisioning allowance) and 22% VAT. 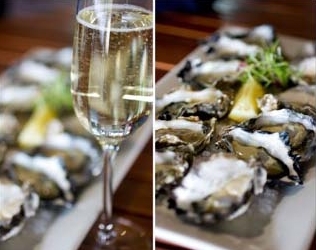 The exciting French Riviera awaits….